My brief talk today comes out of some of the thinking that I’ve been doing about monsters — and bodies described as monstrous — in sixteenth- and seventeenth-century English literature. Some of the most intriguing material from this period takes the form of broadsides or pamphlets that are printed with stories of what the texts call “monstrous births.” These accounts are often accompanied by woodcuts, printed images that represent the features of the “strange” body the text describes. 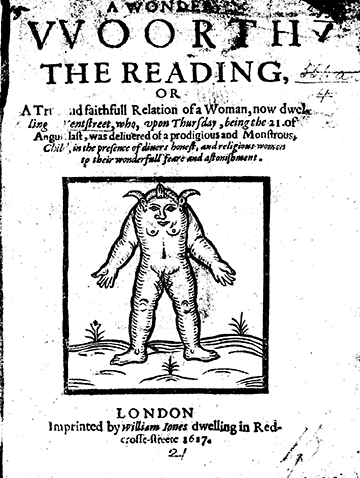 For example, in the 1617 pamphlet, A Wonder Woorth the Reading, the narrator describes “a Female child, with a halfe forehead,” whose mouth and eyes are “miraculously placed in the sayd halfe forhead neere vpon the breast,” the eyes “being very bigg staring and very firy red.” The result, the narrator explains, is that the sight of this “monstrous” body “greatly terrifyed the midwife and all that were present” and everyone was repelled by the “hideous and fearefull forme” (sig. A3v). The idea of deformity — that the body departs from the form of a normal human body — depends upon perception. If something (a body, an object, a painting) is described as deformed, it is different from the form that you expect, even if you couldn’t specify in advance exactly what you expected to encounter. At its most conceptual level, the critic Henry Turner writes, “‘Form’ marks a point of convergence between three distinct moments, the act of recognizing the mere being of a thing, as defined by its form, the act of judging the significance of a thing, as again defined by its form; and the act of coming to some kind of knowledge about that same thing—because one can only know what one can recognize and endow with significance” (582-3). This judgment furthers the logic of perception: the monster is simultaneously seen, judged, and presumably known by departure from a human form. (Recall, for example, about that language from the pamphlet in which the body is described as “that hideous and fearful form.”) The woodcut, a visual representation, is a way of extending the spectatorship of deformity to a wider group of readers. A reader may not have seen this monster for herself at the moment of birth, but the printed version means she gets to encounter the body on her own terms. What might these early modern examples of “strange” forms and visual representation suggest about Shelley’s monster in Frankenstein, written about two hundred years later, described as a “detested form” (67)? Or, as the creature himself puts it to his creator, Victor Frankenstein: “Why did you form a monster so hideous that even you turned from me in disgust? God, in pity, made man beautiful and alluring after his own image. But my form is a filthy type of yours, more horrid from its very resemblance” (88). This deformed creature is not born but made, and the creature’s deformity is a problem of comparison: resemblance to his creator’s humanity only increases the ugliness of his appearance. The act of judging that deformity implies is why it matters, I think, in Shelley’s novel, that the creature can speak. His repeated cries, “but hear me,” “listen to me,” and “hear my tale” (67), are his attempts to impose another interpretation upon his form, so that he can ask for a “companion” who is “of the same species,” with the “same defects” (97). The novel’s insistence on the monster’s speech thus refuses the fantasy of the spectator’s gaze as safely one-sided, suggesting briefly that looking at the monster means the monster might be looking back at you. Yet we get the monster’s story only after he temporarily blinkers Victor with his enormous hands. The only other conversation the creature can carry on at length is with De Lacy, who is blind and encounters him outside of a visual frame. When Walton, the novel’s narrator, sees the creature hovering over Frankenstein’s corpse, he looks at the monster and then can’t look directly at it again because “there was something so scaring and unearthly in its ugliness” (153). The body identified as monstrous, therefore, pushes at the novel’s limit: the limit of sight. The novel foregrounds the tussle between horrified seeing and appalled refusing-to-see in the form of the narrative itself. Let us recall that Victor corrects Walton’s account, especially “giving the life and spirit to the conversations he held with his enemy,” so that the novel is not a “mutilated one” (146), a deformed story. I would like to conclude by suggesting that when the novel insists on the importance of visual perception to judge the creature’s form—even when characters repeatedly look away from the monstrous shape that Victor Frankenstein animates—the narrative prompts and gestures to the range of representations beyond the literary, from films to theatrical productions. These representations, in the centuries that follow Shelley’s novel, continue to confront the questions: What does the creature look like? What do you see when you are seeing the monster, and what do you want to see? Crawford, Julie. Marvelous Protestantism. Baltimore: Johns Hopkins University Press, 2005. Cohen, Jeffrey J., ed. Monster Theory: Reading Culture. Minneapolis: University of Minnesota Press, 1996. Daston,Lorraine, and Katharine Park. Wonders and the Order of Nature. New York: Zone Books, 2001. Garland-Thomson, Rosemarie. Staring: How We Look. Oxford: Oxford University Press, 2009. Shelley, Mary. Frankenstein (1818), ed. J. Paul Hunter. New York: W. W. Norton, 1996. Turner, Henry S. “Lessons from Literature for the Historian of Science (and Vice Versa): Reflections on ‘Form'” ISIS (2010) 101: 578-589. Katherine Schaap Williams is Assistant Professor of Literature at NYU Abu Dhabi.